Surround yourself with the natural landscape of Slovenia on this 6-hour trip to Lake Bled. Visit the Church of the Assumption, Bled Island, and Vintgar Gorge. Hotel pickup and drop-off in Ljubljana, entrance fees, and boat rental fee included. Travel with a small group of just eight people, which ensures personalized attention and an intimate atmosphere. Brilliant day at Lake Bled, the transfer made things much less stressful. Knowledgable and laid back local guide and only 3 of us on the tour. Perfect. This trip was so amazing. We have a short tracking and have fun very much. The driver guide was so nice too. As a group of 8 adults, we thoroughly enjoyed our visit to Lake Bled and the nearby river gorge. Our tour leader Tara, I think was enthusiastic, informative and had a good sense of humour. All the stops were informative and gave a really good overview of salient points of interest. Of particular interest were the gorge walk, the view of Lake Bled and its island, the ferry boat to the island and beautiful location, scenery and local delicacies. Our trip to the castle could be better if there had been an extra 30 minutes to see it better. All in all, a great outing and good value for money. Tour guide Tara was excellent, very knowledgeable and funny. Lake bled was beautiful, tour had all the best bits, wish we'd gone for a full day tour instead of half! A really enjoyable day, well organised and our guide Allenka was knowledgeable and kind. The walk through the gorge was fantastic. Bled is truly the alpine pearl. Great Views, breathtaking scenery. 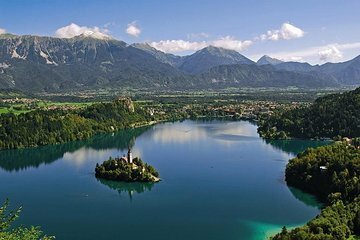 For half day tour, it provides all the must things should do in Bled. Perfect day while traveling to Slovenia. This is an amazing tour and was definitely a highlight of our 2 week trip to Europe! The tour was offered by Nature Adventures and the tour guide was Mythias sorry if Im spelling it wrong!!. He was very knowledgeable, friendly and led the tour at the pace we could keep up with. The tour started with a beautiful scenic drive to the Vingtar Gorge, it was early in the morning so it was not very busy bring a sweater it gets a bit chilly. We were able to hike the gorge at our pace and stop to take lots of beautiful pictures. This is one of the most beautiful and serene places in the world see my pictures! for yourself!. Afterwards we headed to Bled to see the Famous Lake Bled where we took a wooden pletna boat to the island where sits the Church of the Assumption at the top of 99 steps! 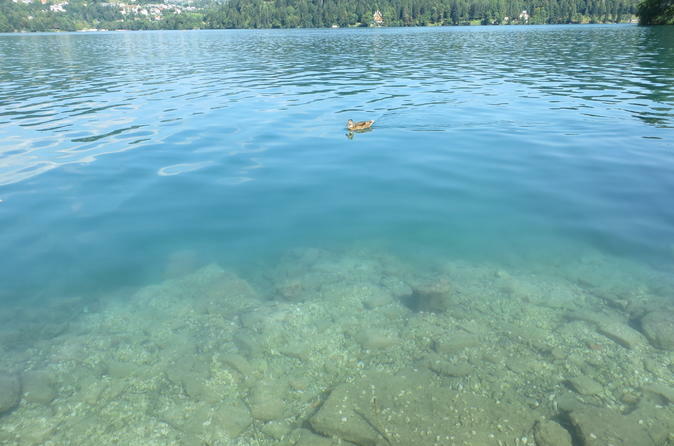 The water on Lake Bled is so crystal clear and beautiful and the ambiance was very relaxed. Mythias told us the history of the lake as well as it's legends which were very interesting and he gave us free time to explore the island on our own. Once we returned to land we hiked up to see the castle that overlooks lake Bled, it had an incredible view! To finish the tour we went enjoyed the famous Bled cream cake at the park hotel overlooking the lake and the beautiful Julian Alps! We took this tour on June 3rd 2016 and would definitely recommend the tour, Nature Adventures and the tour guide Mythias. Mythias thank you so much for such an amazing day exploring beautiful Slovenia and telling us about your country! We very much enjoyed meeting you! This was a fab half day trip to the Vintgar Gorge and Lake Bled with an excellent guide, Alenka. We were picked up from our hotel and the first stop was Vintgar Gorge where we spent around an hour walking from the waterfall through the gorge, where we met again. We then took the short drive to Bled stopped for a photo opportunity and then took the rowing boat across the lake, to the Island where there was time for a slice or two! of potica cake! After this we went to Bled Castle where we had 40 minutes to look around and take some more photos. Our guide, Eva, was excellent! She dropped us off at one end of the Vintgar Gorge and picked us up at the opposite end so we wouldn't have to backtrack. Our pletna boat ride was memorable which is included in the tour, but the church and tower 6 euros is not included on the island. We choose to go to Bled Castle where Eva dropped us off and picked us up right in front of the castle. The entrance to the castle is very steep so that was wonderful. Others chose to have dinner in the central city so she accommodated them also. We were disappointed that Bled Castle had no more of the famous Bled cream cakes left but Eva made sure that we stopped at a local pastry shop near the bus station that served delicious Bled cream cakes.